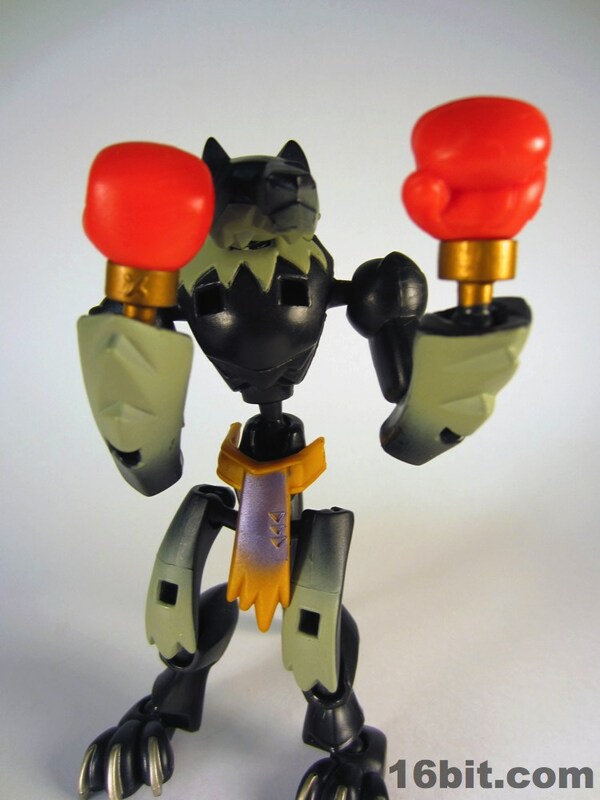 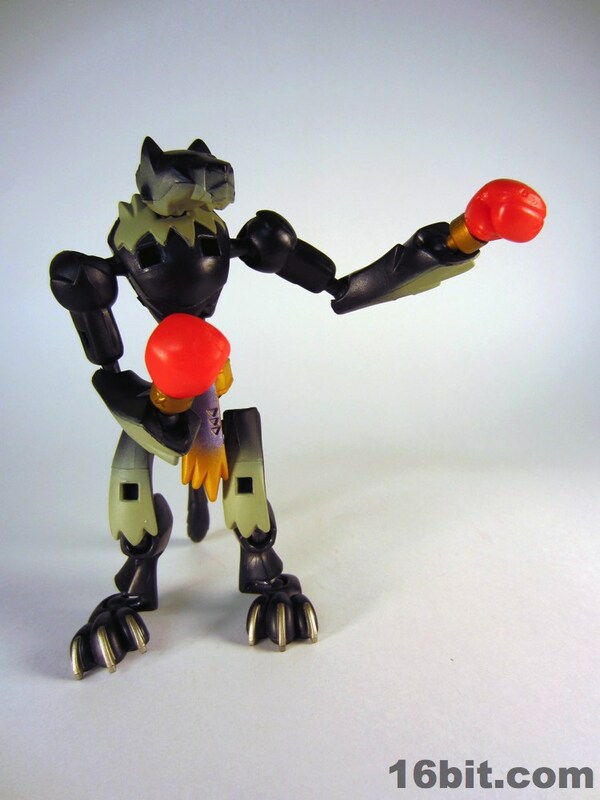 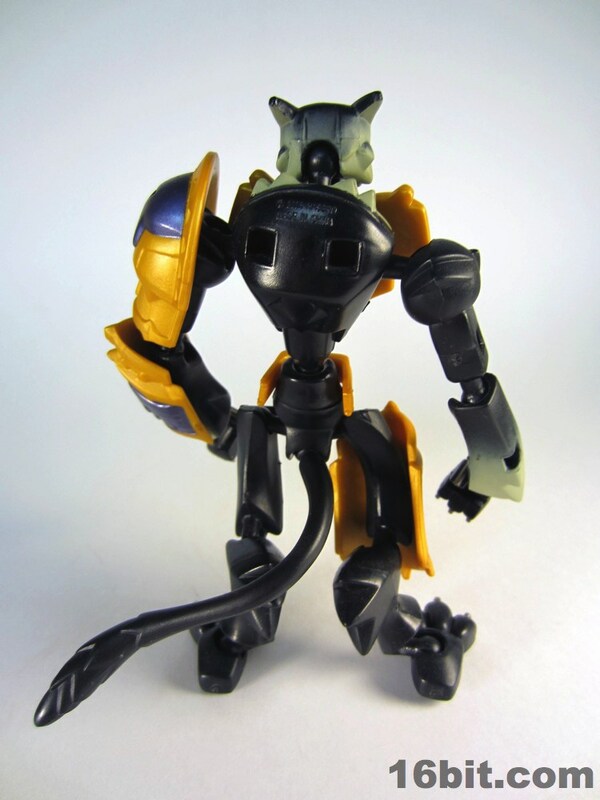 Measuring about 6-inches tall, this cat-like warrior features snap-on armor, boxing gloves, an alternate head, three weapons, and the ability to walk on all fours if you're so inclined. 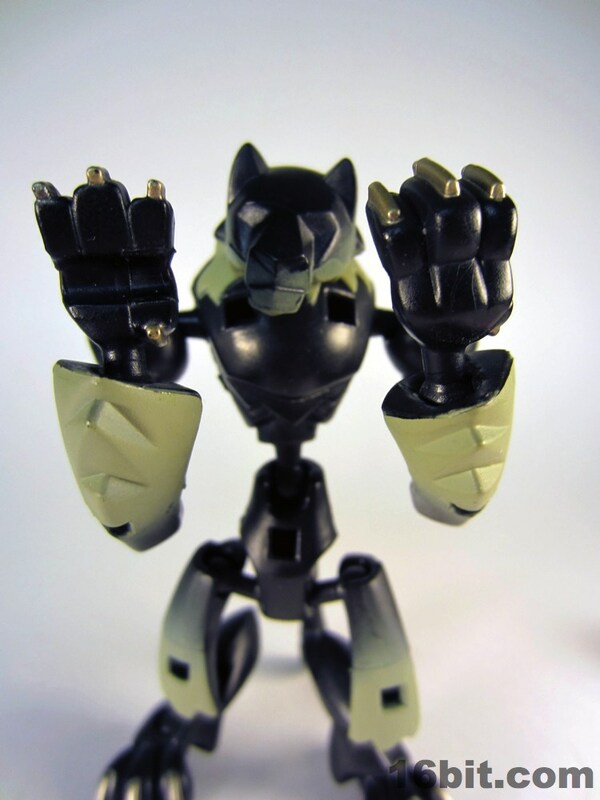 There are alternate paws as well. 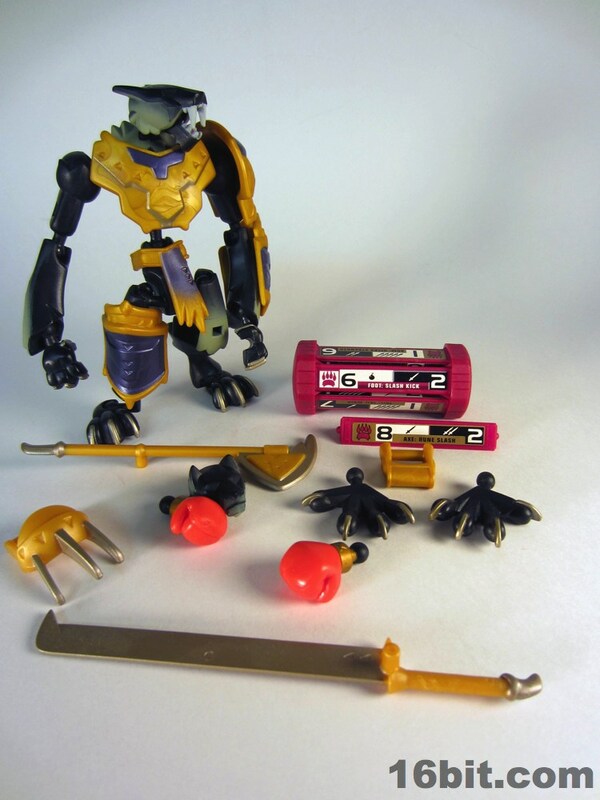 And this thing was about ten bucks-- or if you lucked out at certain Walmarts in the summer of 2004, $1. 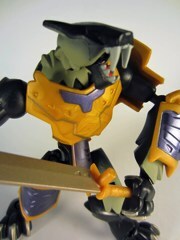 (I lucked out, big time.) 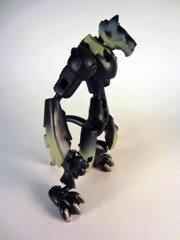 The creature is based on an upsized Stikfas-like system, which features an abundance of articulation and customization possibilities. You have to pop the figure together yourself, but that's part of the fun. 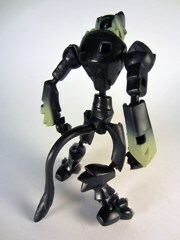 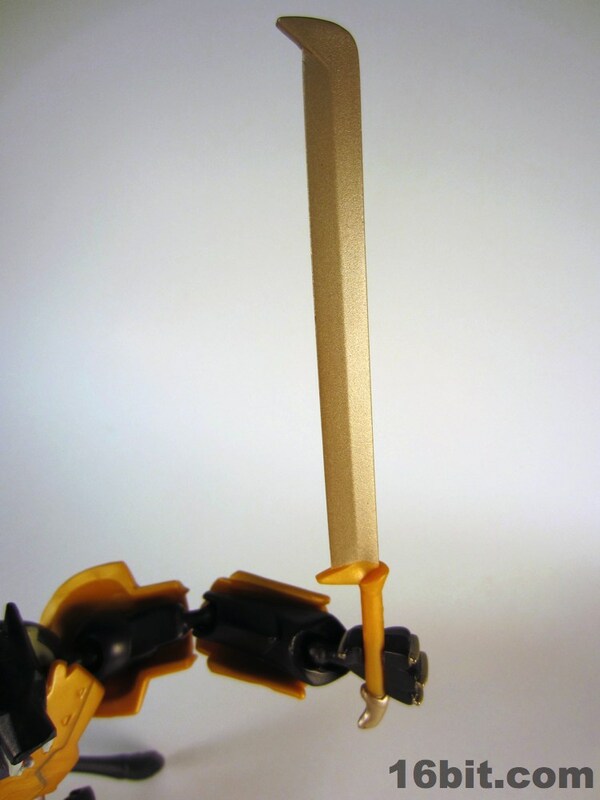 After Bionicle and Gundam had some success in US stores, it makes sense Hasbro would evolve Stikfas into something more toylike. The line suffered from little to no publicity, I recall no marketing beyond a free comic book handed out at Comic-Con, at which point the line was pretty much over. 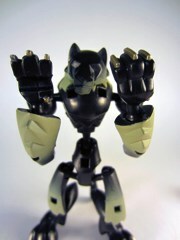 The black plastic figure has metallic claws and a light dusting of a brown color to add some "fur" to the relatively bare buck. Optional stickers were included but are in a box somewhere-- I opted not to use them. 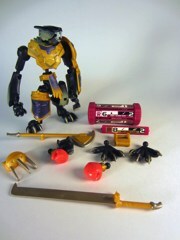 Two heads, three sets of hands, and a suit of armor were included to let you customize this figure or swap parts with other releases. 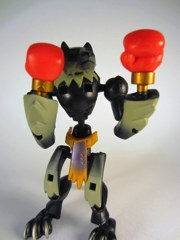 The boxing gloves were a "gag" part, as each figure in the line tended to have one piece purely as a joke. 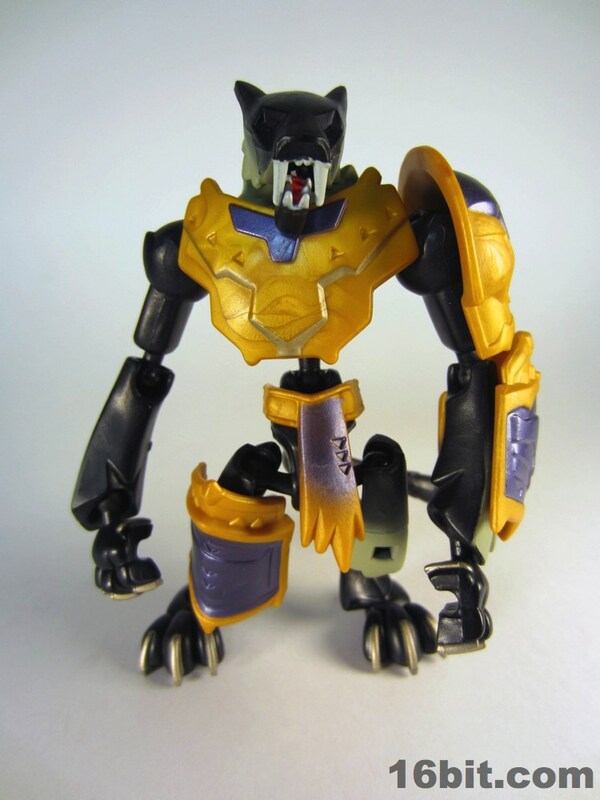 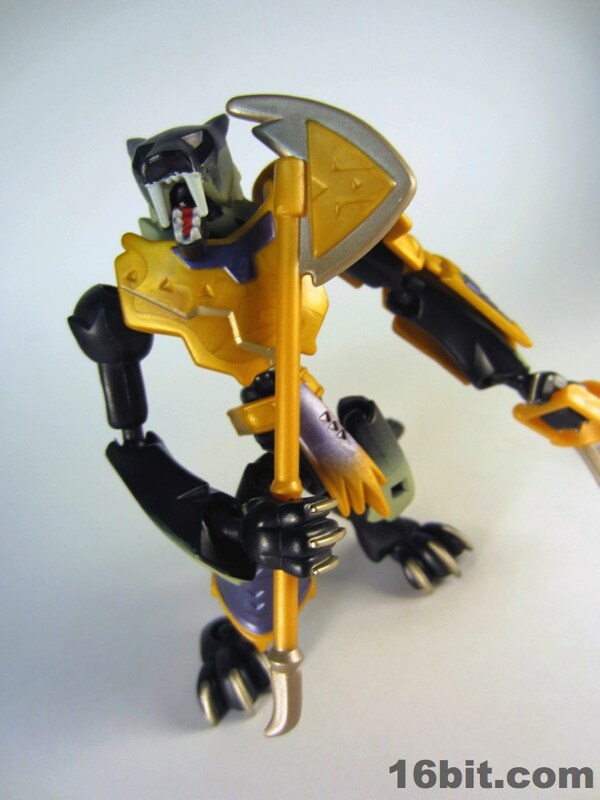 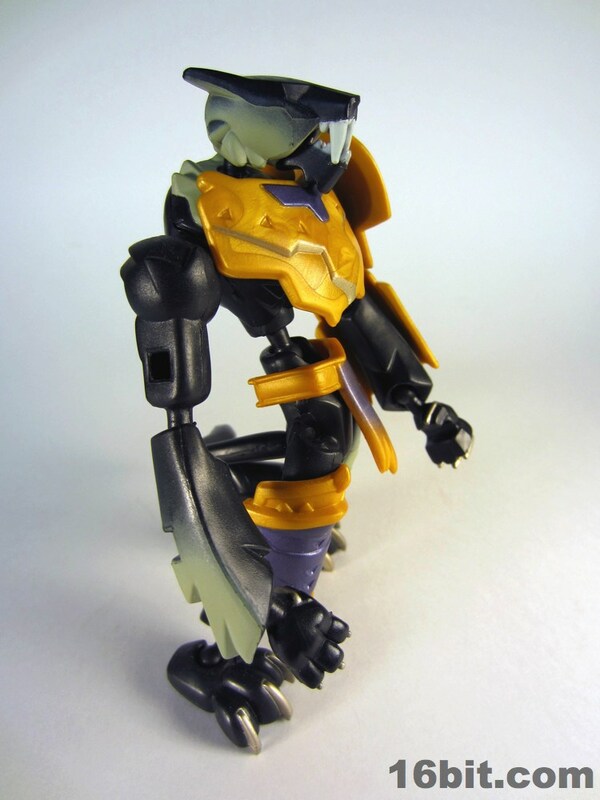 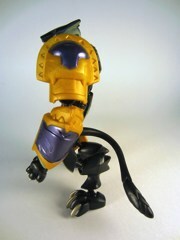 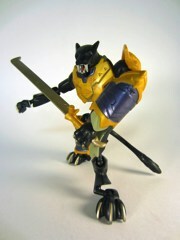 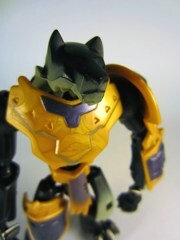 Razorclaw's armor was molded in a gold color with purple painted highlights, and it fit right on the body using a simple system of holes and pegs, which is similar to how you got to be here. 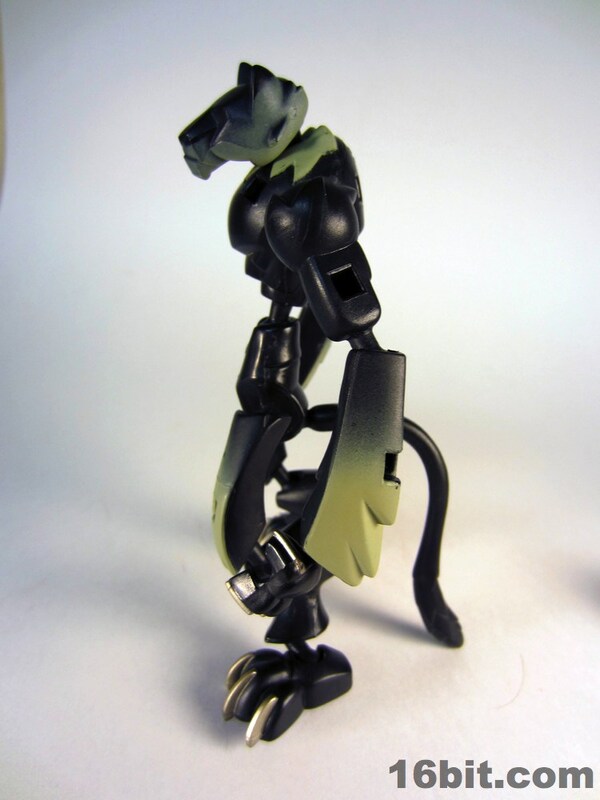 The amount of sculpting is pretty light, with vague shapes implying fur and slopes for eyes. 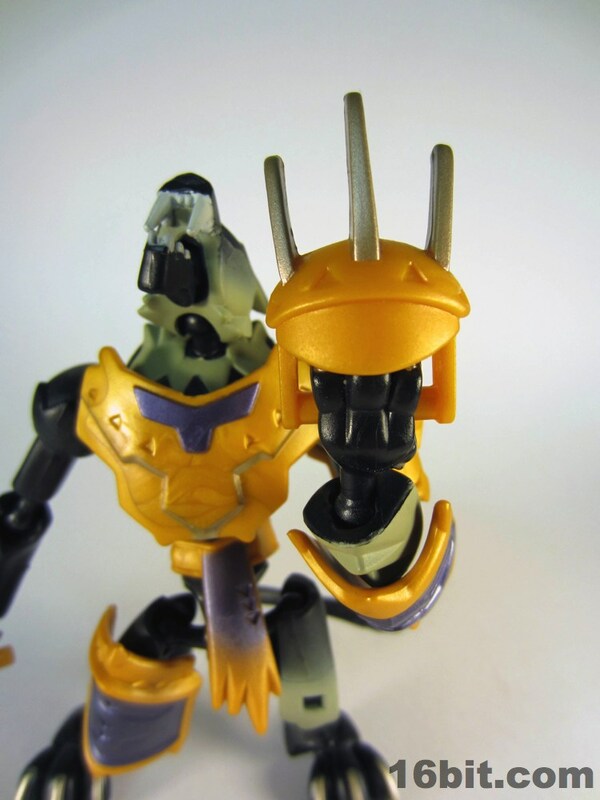 It's highly stylized and has more in common with designer toys than most of what Hasbro sells... perhaps that's why it failed to catch on? 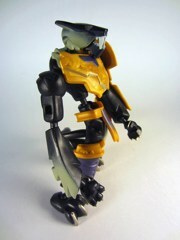 Like most Xevoz figures, he has sizable feet and stiff joints enabling him to assume a variety of poses. 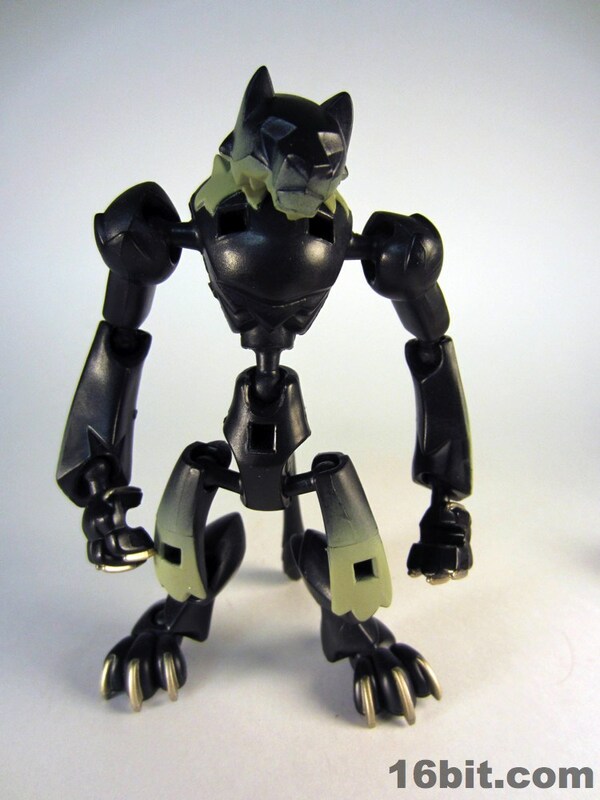 Not only can he stand and sit, but this figure can be placed on all fours to look like some sort of a panther. Given most action figures can barely sit down without problems, it's amazing to see such a simple, yet well-thought-out design emerge out of the 2000s. 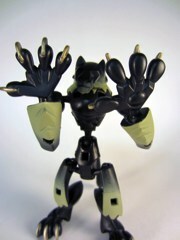 Hasbro reduced the poseability on some figures while increasing articulation, although this line stood out as being sort of a freak in 2004. With 14 points of articulation-- 16 if you count the tail and optional opening jaw-- there really wasn't anything else like it at the time and I would argue nothing since has surpassed it in terms of fun, customization, bang for the buck, or originality. 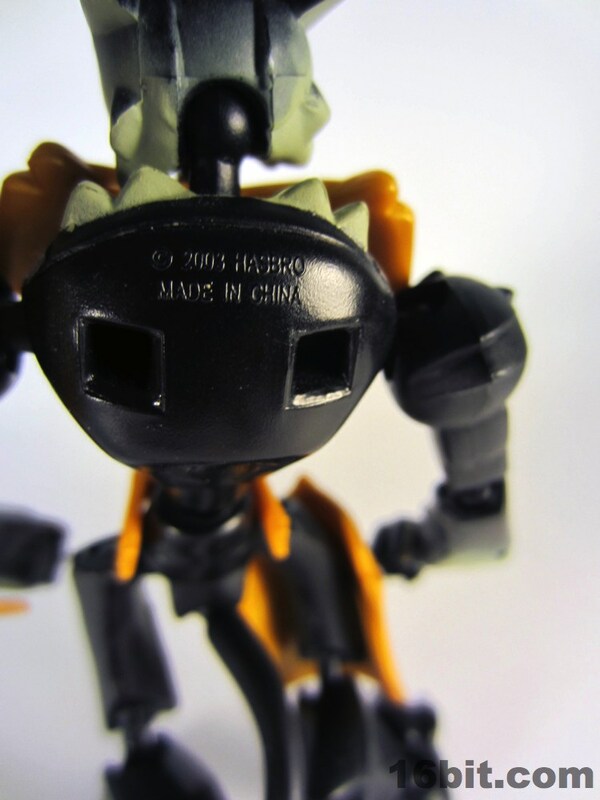 Well, maybe not that last one-- Hasbro stirred a big pot of toy tropes to make this line, which is part of what makes it so great. ...seriously though, go buy some of these. 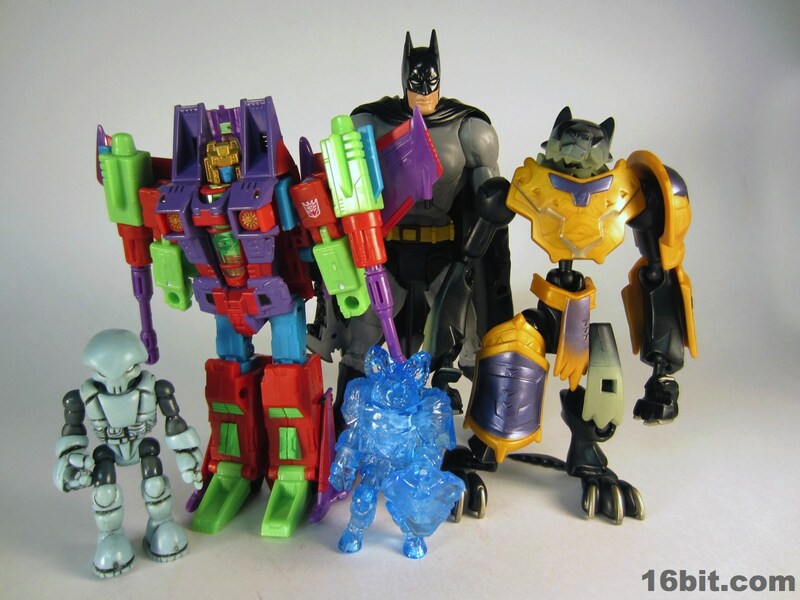 The entire line is about 25 items, including some 2-packs in there.